LUCY BURDETTE: I have often wondered whether the mystery series I wrote before the food critic mysteries might have gotten more traction if it had been published in the era of ebooks and social media. No way to tell, of course, but the happy news is that the first book in the series, DEADLY ADVICE (written as Roberta Isleib), is now available for Kindle. The book stars Dr. Rebecca Butterman, a clinical psychologist and advice columnist living in Connecticut. She works out of an office in New Haven (in the same building where I had my private practice,) and she explores many of the places on the Connecticut shoreline that I've grown to know and love. Although this series is a little edgier than the food critic mysteries, the books are close to my heart because they draw so much from my previous career as a psychologist. In a poignant coincidence, given the terrible news two weeks ago about Robin Williams, DEADLY ADVICE opens with the mysterious suicide of Dr. Butterman's neighbor. She feels doubly troubled about this death, thinking she should have noticed something was wrong--both as a professional and as a neighbor. In addition to my sleuth’s background, that opening scene is also rooted in my graduate school days. During my final year, newly separated, I lived in an anonymous apartment complex with only a nodding acquaintance of the other residents. Each morning, my taciturn next-door neighbor left for work at 7:30, returning by six. Some nights she’d cook one hamburger on the grill outside her door. Medium well, I’d think, considering the time it sat on the coals. How sad, I’d think. Is that me? I’d wonder next. One evening, I came home from the library and noticed a small U-Haul parked in front of her apartment. An older couple was loading the contents of her place into the van. Over coffee the next morning, I skimmed the newspaper as usual, and noticed a small article near the bottom of an interior page. Based on this paragraph, I realized that my neighbor had shot herself several days earlier. Her body had lain in the apartment next to mine for over forty-eight hours before someone found her. I felt shocked and sad. Isn’t this every single woman’s worst nightmare—dead two days and no one even notices you’re gone? As you can imagine, this incident has always haunted me. Years later, that’s where DEADLY ADVICE began. When Dr. Rebecca Butterman returns home to find her neighbor an apparent suicide, she's wracked with guilt. As a psychologist and advice columnist, she’s an expert! She should have been able to help the young woman. But the neighbor’s mother suspects foul play, and soon persuades Rebecca to investigate the possibility of murder. In honor of the launch of DEADLY ADVICE as e-book, I'm happy to share one of Dr. Butterman's favorite recipes, beef carbonnade. She would tell you to start the dish the day before you plan to eat it so it can sit in the refrigerator overnight, allowing the flavors to blend. She would also tell you that serving this meal to sad people might make their world a tiny bit brighter. We hope you enjoy the book and the stew! I am definitely heading to the grocery store so I can try the beef recipe . . . it sounds wonderful. 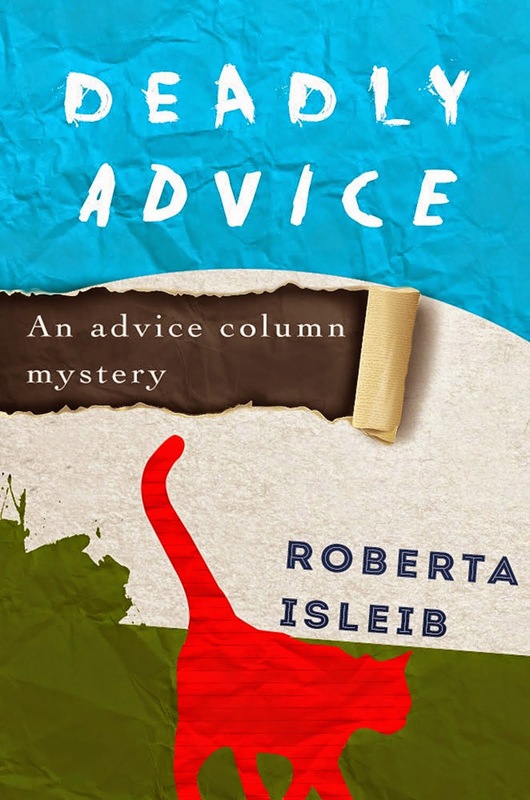 First, though, I'm going to have to hunt up your "Deadly Advice" . . . .
Great idea to rerelease, Roberta. I loved that series and read every book in it. Looks like you got a new cover made. Tell us about that? And any plans to us more Rebecca Butterman books? Thanks Joan--hope you enjoy both of them! Edith, thank you:). As for the cover, on Hank's advice, I set up a contest on 99 designs. It was fascinating--all the choices. And hard to choose! I picked this one because I thought it would pop as a thumbnail. I am converting the other two in this series later this year. As for more? Not sure--I can't write as fast as you!! Oops. Obviously that should have read, "...to give us more..."
Congrats on the re-launch of DEADLY ADVICE. I agree social media could've given it a boost, but the book was ahead of it's time, especially in that respect. You're right about the cover, great impact as a thumbnail. This was a poignant book I'd like to revisit, so I went ahead and bought it in Kindle, too. So happy to see this news, Roberta. I loved this series. Maybe you'll stir up enough interest so we can have more tales of Rebecca Butterman. That would be even better news! I loved Rebecca Butterman. I would love to see this series again, Lucy/Roberta. I think the re-launch of "Deadly Advice" is brilliant! And I'm for sure going to be giving this recipe a try. (Great cover!). Love the cover, Lucy. And I'm a huge fan of this series. Anyone who missed it has a treat coming. And yes, food and mood are completely conflated (is that the right word) for me. When one of my daughters is sad, I cook her something special and then take her shoe shopping. Sometimes it works. Haven't read this series yet but plan to. OH, you can think of a new plot.You've got a MILLION of them! But was it difficult/complicated/fun/educational to set up your own release? Lots of new stuff to learn! I love the story behind the story. It gave me chills! Congratulations on the ebook release -- I'm off to download it! Hank, I didn't do this for a while because I dreaded figuring it out. I ended up using my agent's ebook platform because I felt I needed to concentrate on writing:). I applaud everyone who does it themselves! Great cover, Lucy! It does pop as a thumbnail--I can attest as I just bought it. I haven't read this series and am really looking forward to all the books! I'm happy to say that I already have Deadly Advice awaiting me on my Kindle. The cover contest was a clever idea (kudos to Hank), and I love the one you went with, Lucy. Great thinking about what it would look like as a thumbnail. I'm thinking that Deadly Advice will be a great ebook read on my upcoming vacation. Sounds like you already have quite a few fans here of the series. The beef recipe should be delicious, but like Debs, it's too hot now for anything but cold sandwiches and salad. Lovely post, Roberta! Off to download DEADLY ADVICE! You have got a real fan club here! I'm convinced. I will have to read Deadly Advice. Good luck with the ebook, Roberta. I'll help spread the news. I bought the three books in this series at the Key West event at Kelly's this winter celebrating the latest food critic book publication. I agree, there should be more of them, as well as more KW food critic books as well.